FOI reveals shocking extent of homelessness amongst prisoner leavers. Many readers will have seen Emily Goddard’s (@emilysgoddard) article in Wednesday’s guardian portraying the misery of the increasing number of people released from prison with nowhere to live. The article is based on data from a Freedom of Information request submitted by the redoubtable Revolving Doors Agency. This blog post provides more detailed information from the FOI and shows just how much the number of homeless prisoners has risen over the last two years. The findings are truly shocking. 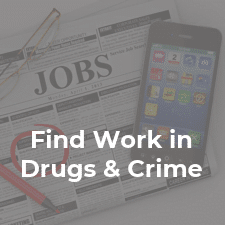 The data were provided for seven consecutive quarters from October 2016 to June 2018. 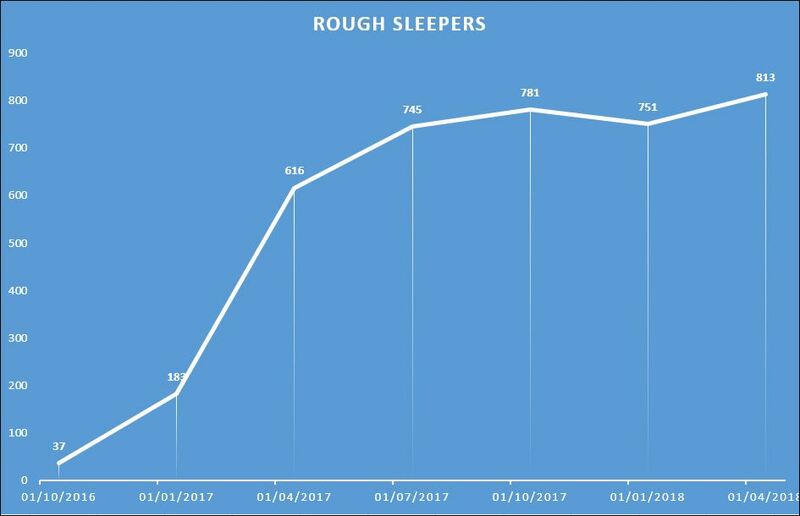 The growth in the number of released prisoners sleeping rough is startling: 37 individuals in the quarter beginning on 1st October 2016 to 813 people in the quarter starting on 1st April 2018. This is an increase by a factor 22 while the number of released prisoners remained basically the same (19,627 people released in the earliest quarter, 18,971 in the latest). Part of this massive rise is explained by the fact that the MoJ now has much more information about where released prisoners are living. For the first quarter in this series, it had no information about 32% individuals, this figure had dropped to 11.6% by the most recent period. In effect, the MoJ has more fully uncovered the extent of the homeless released prisoner population. Other points to note are that in the latest quarter 5.1% women prison leavers were rough sleepers compared to 4.2% men. Unsurprisingly, these figures are even worse for those being relased after short sentences (defined her as being sentenced to less than six months) where 7.7% short sentence women were sleeping rough and 7.4% men. 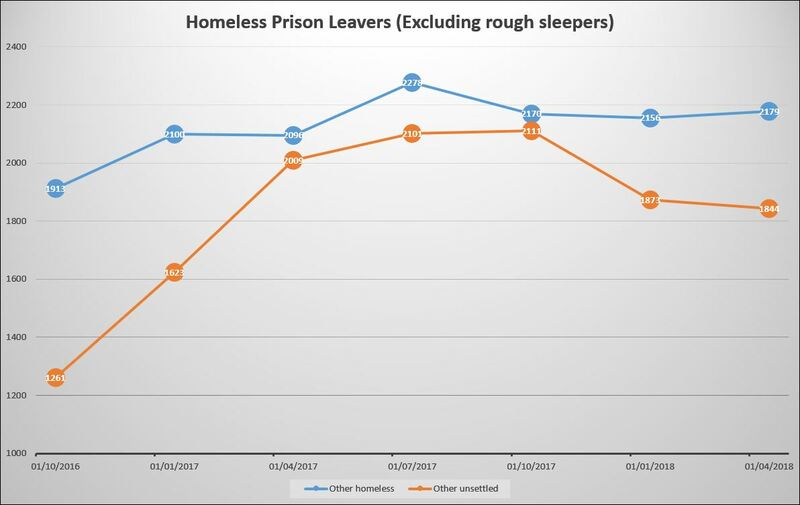 In addition to these very high figures for released prisoners sleeping rough, there have been noticeable increases in the numbers being released to other forms of inappropriate accommodation. The number of people classified as “homeless other” increased slightly from 1,913 in April 206 to 2,179 in the April-June 2018 period while the numbers defined as being in “other unsettled accommodation” rose significantly from 1,261 to 1,844. Interestingly, the number of people in HMP accommodation more than doubled from 806 to 2,004. 14% female prison leavers were categorised as “other homeless” vs 11.2% males in the most recent period. 12.2% women were deemed to be in “other unsettled accommodation” compared to 9.5% men. The figures are, again, much worse for those serving sentences of 6 months or less with 17.1% classed as “other homeless” (18.4% women and 17% men) and 10.9% as being in “other unsettled accommodation” (12% women and 10.7% men). One crumb of comfort is that the figures for people in “other unsettled accommodation” have reduced over the last two quarters. 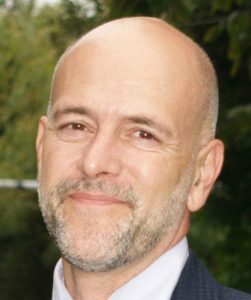 The failed re-organisation of the probation system via Transforming Rehabilitation with Community Rehabilitation Companies generally failing to deliver through-the-gate support. Cuts in housing and homelessness support across the years of austerity. Most significantly, the continual decline in the availability of all forms of affordable housing. The MoJ are considering making CRCs more accountable for helping offenders (both those released from prison and those in the community) find accommodation under the new TR contracts which will come into force in 2020. In my opinion, it is hard to see how CRCs will be able to deliver on this objective since they have no influence on the amount of available accommodation. coming into reception, many who are homeless.